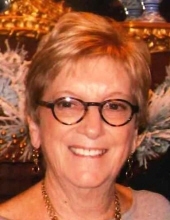 Dorothy Grant Sealy passed away surrounded by love on January 31, 2019 after a long, courageous and spirited battle with ocular melanoma. Born February 23, 1948 in Waterbury, CT to the late Florence and Joseph Grant, Dorothy grew up in Naugatuck, CT attending St. Francis and Naugatuck High Schools. She went on to pursue a teaching degree from Central Connecticut State College and a Master’s in Education from Southern Connecticut State College. Oxford, CT was her home for the next three years where she taught sixth grade math. The beach being her favorite place, it was only natural that the oceanside was where Dorothy met John, the love of her life, who she married in May of 1973. Shortly after their marriage, John was assigned a company position in South America. They spent the next 10 years living in Brazil, Venezuela, and Chile. During that time, Dorothy taught in the American schools as well as taught English as a second language to adults. They returned to the states in 1982 and settled in Troy, MI with a lifetime of memories and a family of two children. Dorothy was grateful that she could be a stay at home mom and was always very involved in their children’s school and sport activities. Dorothy had the habit of raising her hand whenever she heard the word “volunteer”. Consequently, she could usually be found on a committee in some capacity. She also clocked many hours sitting in the bleachers cheering on her children’s teams. Enjoying staying connected with children, Dorothy taught religious education at St. Thomas, substitute taught at Holy Name, volunteered at the Health Clinic at Troy High school as well as the Ronald McDonald House in Detroit. With any free time, Dorothy enjoyed cooking, reading, playing tennis, mahjong, and of course lunch or cocktails with friends. Dorothy cherished spending time playing board games and cards (even though she was the Old Maid most of the time) with her six adored grandchildren. Elaena, Graham, and Quinn Dutcheshen and Jude, Hudson, and Reid Sealy. Besides her best friend and husband John, Dorothy is survived by her devoted children Jennifer (Nick Dutcheshen) and Chris (Nicole Sealy). She will also be greatly missed by her brother Robert Grant (Katerina) and sister-in-law Ellen Dunn as well as numerous cousins, nieces, and nephews. A Memorial Mass for Dorothy will be celebrated on Saturday February 9, 2019 at 10am at Holy Name Catholic Church, 630 Harmon Street, in Birmingham, Michigan. Memorials appreciated to Dana-Farber Cancer Institute, 450 Brookline Avenue, Boston, Massachuetts 02215. "Email Address" would like to share the life celebration of Dorothy G. Sealy. Click on the "link" to go to share a favorite memory or leave a condolence message for the family.